You are here: Home › News and Updates › Urgent Call to Action: Rashid Johnson Needs Our Help! Our friend Rashid is being retaliated against for his prison organizing. 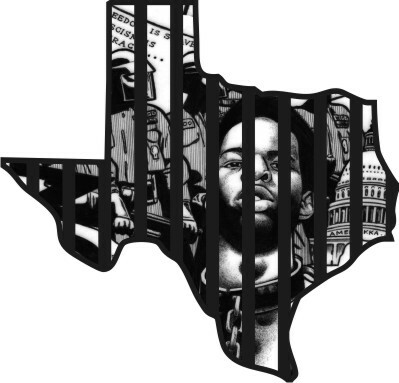 He had a shank planted on him (see “Planted Weapons and Stolen Property: Mounting Retribution for Continued Exposures of Abuses in Texas Prisons” and “Rashid Attacked – Again: Texas Prison Officials Will Not Stop Us From Exposing Them To The Media”). Please call the following numbers. You may use the script below. Hello, my name is _____________. I am calling to make a formal complaint on behalf of Kevin “Rashid” Johnson, inmate number 01859887. A weapon was planted in his cell on March 23, by prison staff, and there are statements by various witnesses attesting to this. As a result, his property was seized, including his legal materials that he needs for ongoing cases. I am also calling to request that his property, including his legal materials, books, and typewriter, be returned. I believe that being denied access to his legal materials impedes his ability to access legal redress. I believe that planting a weapon on him and taking his materials is retaliatory for his work exposing wrongful prison deaths. Regardless, legal materials do not pose a security threat to other inmates or correctional officers, and there is no legitimate security reason to keep him from having access to his books, writings, or typewriter. I will be following up to make sure that his materials have been returned. This is a formal complaint about the mistreatment of Mr. Kevin Johnson, TDCJ # 1859887, by the staff at the William P. Clements Unit in collaboration with Mr. Michael Wheeler, in the Access to Courts, Counsel and Public Officials Department of the Texas Department of Criminal Justice. Since he has been confined at the Clements Unit Mr. Johnson has been subjected to repeated attempts to deprive him of his legal property under various pretexts, all in response to his many published articles exposing abuses and killings of prisoners at the Clements Unit and his involvement in litigation against abuses and retaliatory interstate transfers. His property was taken on Dec. 21, 2016 under a false pretext and was ultimately returned to him on January 25, 2017, after considerable protest, exposure and complaints against this and other abuse. When Mr. Wheeler and Clements Unit law library staff discovered that Mr. Johnson had brought suit against them, they joined in targeting his property once again, using deliberate misapplications of TDCJ Access to Courts policy to give illegitimate excuses for their actions. On April 6, 2017, under the pretext of conducting a fifth subsequent storage review in less than four months, prison staff confiscated most all of his legal property including pending case records, evidentiary and reference materials, law books unavailable in the law library, and more. The pretext used was that all the confiscated material related to inactive cases, which was untrue. One closed Oregon federal case Johnson v. Peters case # 2:13-cu-00460 which Mr. Johnson was preparing and researching to file a post-judgement motion in to re-open it, was used as a pretext. He was thus forced to file the motion on April 14, 2017, without use of this needed property and case record. This is a clear denial of Mr. Johnson’s court access rights. This was an active case. Material related to newly filed, as well as previously pending cases were also taken, including cases against his retaliatory interstate transfers due to his published writings exposing prison abuses. His materials were taken in violation of the subsequent storage provisions of the TDCJ’s Access to Courts Procedures Manuel which requires that the prisoner be present and participating in all such reviews. Mr. Johnson was placed by the Clements Unit ATC Supervisor Darryl Glenn into a holding cell in another area of the prison as he and his staff went into Mr. Johnson’s cell and arbitrarily confiscated materials chosen at random, illegally reading many of these materials in the process. They arbitrarily took over 140 inches of materials, despite Mr. Johnson having numerous pending cases, and many other anticipated ones. This included case files in which he had pending court ordered deadlines, such as a separate Oregon Federal case, Johnson v. Peters case # 3:17-cu-0460-AA. They refused his repeated requests to explain and show them that the taken property was not related to inactive cases. These facts amount to a gross violation of Mr. Johnson’s legal rights under the law. I strongly protest the TDCJ’s cruel and unjust treatment of Mr. Johnson, including this confiscation of his legal and other property, including his typewriter used for his writings and legal appeals. I also want to register my strongest condemnation of TDCJ’s violation of Mr. Johnson’s health and safety in gassing him, failure to promptly decontaminate his cell and bedding, and accusing him of being in possession of a weapon which was obviously planted in his cell while he was removed from it. It is clear to me that the multiple violations of Mr. Johnson’s rights and the multiple abuses he has suffered at the hands of TDCJ staff amount to cruel acts of escalating retaliation for Mr. Johnson’s exposure of criminal acts by prison staff that have caused immense suffering and even death for prisoners in your system. How will you proceed to correct such abuse?